Somdev brushed aside Indonesian Wisnu Adi Nugroho 6-1, 6-2, 6-2 in the first singles tennis match. 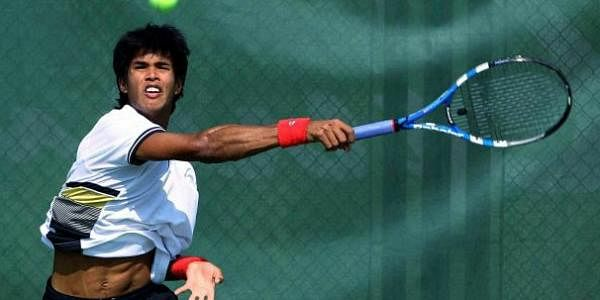 Somdev Devvarman, though nowhere close to his best, still carried far too much ammunition as he brushed aside Indonesian Wisnu Adi Nugroho 6-1, 6-2, 6-2, in the first singles tennis match to give India a 1-0 lead in the Asia-Oceania Davis Cup Group 1 relegation play-off here Friday. On a warm and humid afternoon, the 28-year-old Devvarman, ranked 208, was in a different league and though he turned error-prone towards the fag end of the match, Nugroho could not capitalise and lost rather tamely. The slow-paced match had little to offer by way of thrills as Devvarman was rarely in trouble and virtually did as he pleased with Nugroho clearly looking out of depth. Devvarman began well with an ace in the very first game of the match to set the pattern. He broke 1774-ranked Nugroho twice in the fourth and sixth games to wrap up the set in good time. The trend continued in the second with the Indonesian, unable to find his feet, again broken twice in the first and seventh as Devvarman raced to a 2-0 lead. In the third set, Nugroho showed some fight and even had break points with Devvarman appearing rather wayward. But the Indian ace quickly regrouped and with two breaks of serve in the first and third games, closed the match -- though not before saving two break points in the eighth.